Powers/Abilities: Flashfire has the ability to conduct bio-electrical energy through his body, using it as a light source or to shock others with lightning-like bolts. He can fly either under his own power or by using a Shi'ar anti-gravity device. It is unknown if his abilities are possessed by his entire race or solely him. The full extent of his abilities is likely unknown. (X-Men I#107) - Members of the Imperial Guard fought the X-Men (Banshee, Colossus, Cyclops, Nightcrawler, Phoenix (Jean Grey), Storm, Wolverine) and Starjammers (Ch'od, Corsair, Cr+eee, Hepzibah, Raza) at the M'kraan Crystal, in order to stop them from rescuing Lilandra from D'ken and Davan Shakari. When the X-Men arrived, Astra demanded to know who they were. 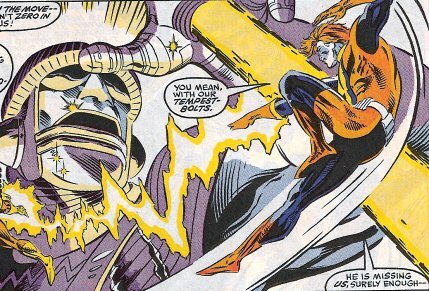 During the battle, Tempest was scattered by Banshee's scream, then he ordered Hobgoblin to create a distraction. Tempest was taken down when Storm hit him with lightning, though after recovering he tried to fire at the X-Men to no avail and was subsequently taken down by Ch'od. D'ken was rendered comatose and Lilandra took over as the new Majestrix. Members of the Guard in this mission: Astra, Electron, Fang, Gladiator, Hobgoblin, Impulse, Magic, Mentor, Midget, Nightside, Oracle, Quasar, Smasher, Starbolt, Tempest, and Titan. (Rom Annual#4) - In far space, Guard members Binder, Chakar, Kwill, and Voltor were killed by the maddened Spaceknight Pulsar. 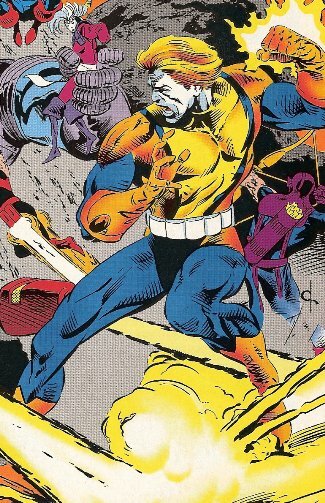 Former Shi'ar ally Dr. Tyreseus donned Pulsar's armor and, calling himself Liberator, began slaying Shi'ar ships. Members of the Guard were sent to investigate, and battled other Spaceknights, Rom, Scanner, Seeker, and Trapper. During the battle, Tempest and Electron fired at Scanner, who evaded their blasts and caused them to hit each other. Gladiator ended up aiding the Spaceknights in destroying the Liberator. Guard members in this mission: Electron, Gladiator, Magic, Manta, Oracle, Tempest, and Warstar. (X-Men: Spotlight on Starjammers#2) - At Deathbird's orders, a large group of the Guard attacked the Starjammers and Excalibur (Captain Britain (Brian Braddock), Lockheed, Meggan, Nightcrawler, Shadowcat, Phoenix (Rachel Summers), Widget) on Earths, but they retreated when Deathbird was put at risk. During the battle, Shadowcat phased and Tempest and Electron hit each other with their powers accidentally. Guard members who participated in this assault: Astra, Black Light, Blackthorn, Earthquake, Electron, Gladiator, Hobgoblin, Impulse, Magik, Mentor, Midget, Nightside, Oracle, Smasher, Starbolt, Tempest, Titan, and White Noise. (Uncanny X-Men I#275) - The Imperial Guard was attacked by a group of Warskrulls posing as the Starjammers. The Guard seemed to be winning until the X-Men (Forge, Gambit, Jubilee, Psylocke, Storm) joined the fight against them, and the Guard was quickly overwhelmed. Guard members in this mission: Earthquake, Gladiator, Mentor, Oracle, Smasher, Starbolt, Tempest, Titan, and Warstar. (Captain America I#398) - Warstar fought Captain America on Earth while Electron, Oracle, and Tempest grabbed Jones. (Avengers West Coast#80) - Oracle got the information they needed, and they returned to the Kree base and Tempest retrieved the machinery. After they were rejoined by Warstar, Kree Sentry 372 attacked and the Avengers (Captain America (Steve Rogers), Hawkeye (Clint Barton), Iron Man (Tony Stark), Living Lightning, Mockingbird, Scarlet Witch, Spider-Woman (Julia Carpenter), USAgent, Wonder Man) arrived. Battle ensued and Tempest passed the component to Oracle. Tempest was attacked by Wonder Man, whose ionic powers shorted out Tempest's anti-gravity device, sending him falling to the ground. Wonder Man then knocked Tempest out, but the Guard escaped to their ship and returned to Shi'ar space. (Avengers I#347) - Members of the Guard accompanied Lilandra and Araki in claiming the Kree Empire for the Shi'ar. Members of the Guard in this mission included: Electron, Flashfire, Impulse, Oracle, and Titan. (Silver Surfer III#79) - Gladiator, Tempest and Oracle were on a recon mission in uncharted space. Gladiator left the ship when they received anomalous power readings. Tempest and Oracle lost contact to him. (Imperial Guard#1 (fb)) - Lilandra sent eight of the Guard to Earth to watch out for Kree militants and to protect the planet in the absence of its heroes (many of whom had been seemingly killed by Onslaught, a composite entity of Professor X and Magneto). Members on this mission included: Commando, Earthquake, Electron, Flashfire, Gladiator, Mentor, Nightside, and Oracle. They aided the Avengers (Black Widow (Natasha Romanova), Hercules, Quicksilver) against Primus and his People's Underground Militia. After the battle, Electron helped stabilize a crashing building, then told Hercules when they were all safe. Flashfire was very eager during this battle. (Imperial Guard#1) - During down time, Flashfire argued with Commando for getting too near his personal space. The two nearly came to blows, and Flashfire spouted racist rhetoric at his Kree ally while the other Guard members watched. When Gladiator entered, Flashfire put it off to harmless fun. Soon, the Guard battled the Militia again, but the Guard was defeated this time. (Imperial Guard#2) - The Guard escaped and fought their way free. They soon discovered the Militia were Kree operatives. They fought the villains again, and Flashfire used his powers to propel cars into the soldiers. The Guard helped authorities clean up after the villains escaped. (Imperial Guard#3) - While tracking the Militia again, the Guard discovered that the Kree planned to detonate a Nega-Bomb. Flashfire had more negative things to say about the Kree. They allied with Rick Jones (who'd been powered by the Supreme Intelligence), and he absorbed much of the bomb's radiation, then Flashfire used his powers with the others to reduce the machine to slag. The Guard learned that the Supreme Intelligence was on Earth. (Inhumans IV#3 - BTS) - Flashfire and Oracle grew determined to marry and leave the Guard together. (Inhumans IV#4) - Lilandra represented the Shi'ar Empire on the planet Kritnah in the marriage ceremony with Emperor Eson of the Spartoi while the Imperial Guard stood by. Black Bolt moved to attack Lilandra, who set up a shield and activated the Guard against the Inhumans. Black Bolt screamed, seemingly slaying Lilandra. The Guard moved in at full force. Flashfire briefly battled Triton. The Inhumans teleported away, escaping. Lilandra's form was revealed to be Hobgoblin, who appeared to be dead. Lilandra, as a hologram, revealed herself and told the Spartoi that the union was off due to their atrocities. Jason of Spartax was blamed for being behind it. Members of the Guard in this mission: Astra, Delphos, Earthquake, Fang, Flashfire, Gladiator, Hobgoblin, Hussar, Impulse, Mentor, Neutron, Nightside, Oracle, Smasher, Starbolt, Titan, Warstar, and others. (Marvel Encyclopedia: X-Men/Realm of Kings: Imperial Guard#4 (fb) - BTS) - After his wedding to Oracle, Flashfire returned to the Guard. Flashfire did something to harm their relationship and they broke up. (X-Men: Watchers on the Walls: Chapter 5: Extinction Agenda) - Smasher and Flashfire aided the X-Men in getting to the Diascar decontamination center. The X-Men met Poratine and Taforne, representatives of the Diascar, who discussed the threat of the Chlorites for the human population. Xavier demanded to speak to Lilandra, and Smasher put him in contact, and she assured him that the Guard were acting on her orders and the Chlorites were dangerous for Earth. (X-Men: Watchers on the Walls: Chapter 12: Excursus) - Flashfire worked with Cyclops, Iceman, and a reformatted Sentinel to take down one of the Chlorites in Cincinnati. (X-Men: Emperor Vulcan#5) - Electron's group attacked the Starjammers and Flashfire was held off by Korvus until Ch'od slammed Flashfire's head into the ground, knocking him out. The Starjammers managed to defeat Electron and his allies, but Deathbird lead the rest of the Imperial Guard and defeated the Starjammers, then teleported back to save Vulcan from Havok. Days later, the Imperial Guard (Electron, Flashfire, Gladiator, Manta, Mentor, Nightside, Oracle, Plutonia, Scintilla, Titan, Warstar) stood by Deathbird, Araki, and Ka'ardum as the Shi'ar cheered on Vulcan. The Starjammers (Ch'od, Havok, Polaris, Raza) lay captive. (War of Kings#1) - Vulcan surveyed, with Gladiator, the assembled Imperial Guard. Mentor reported they were all battle ready and Vulcan announced his intentions to attack the Kree. They soon engaged in a massive battle with the Inhumans and Starjammers, successfully capturing Lilandra before retreating. Members of the Guard in this mission: Astra, Black Light, Earthquake, Electron, Fang, Flashfire, Gladiator, Hussar, Impulse, Magique, Manta, Neutron, Nightside, Plutonia, Schism, Scintilla, Shapeshifter, Smasher, Squorm, Starbolt, Titan, Voyager, Warstar, and White Noise. (Realm of Kings: Imperial Guard#4 (fb) - BTS) - Flashfire still regretted what he did that ended his marriage with Oracle. (Realm of Kings: Imperial Guard#1) - When the planet of Izumbard refused to create more warships for the Shi'ar, the Imperial Guard (Earthquake, Electron, Flashfire, Neutron, Plutonia, Titan, Voltar, Warstar) were sent to quell the riots. During the ensuing battle, Flashfire absorbed the enemy artillery and Voltar was killed. Another branch of the Guard (Commando, Fang, Gladiator, Hussar, Manta, Starbolt) soon arrived to aid in the battle. Later, at their barracks, they proposed a toast, and Manta recognized the loss of Voltar. A fight broke out and Flashfire was about to get involved when Mentor, Smasher, and Oracle interrupted the fight. Mentor told them that they'd just volunteered for a special strike force mission due to their bad behavior. The next day, they learned they'd be going for recon into the Fault, the rip in time and space, alongside Ch'od and Raza of the Starjammers. (Realm of Kings: Imperial Guard#3) - Over the following six hours, as the dead ship grew around the Starjammer, the Guard worked to repair their ship. Oracle soon discovered the ship had been killed while running from something else. As enzymes attacked them, they realized they need to rush away before they were digested. As the ship was nearly overwhelmed, Starbolt and Flashfire got back and burned the monsters up. Using Starbolt to power the ship's engines and Flashfire to trigger an autonomic response in the ship (causing it to open its jaws), Mentor successfully piloted the Starjammer free. They soon came across a massive field of debris. They followed an energy signature, hoping to find Vulcan, when Warstar and Neutron were hit by a massive energy burst. When the air cleared, they saw Quasar (Wendell Vaughn) there, with a massive biological entity pursuing him. (Realm of Kings: Imperial Guard#4) - Oracle managed to send a telepathic call for help through Quasar's quantum powers into the M'Kraan Crystal, reaching Gladiator. . The Guard hid themselves in the debris zone and outside, the Guard (Fang, Flashfire, Neutron, Smasher, Starbolt, Warstar) worked on gathering debris to act as a buffer and shield around their ship.. Soon, Fang proposed a final toast of Aedian Psi-Wine, away from Mentor, and suspecting they might all die. On the ship, Ch'od realized someone had sabotaged their ship, and Mentor realized it must be the new Smasher, who was soon revealed as Talon of the Fraternity of Raptors. Talon had retrieved two amulets of power from the Fault and claimed he could use them to give the team greater firepower for the coming battle. Outside the xenoform beings attacked in the form of the X-Men and Starbolt was quickly killed in battle. Flashfire reported that the massive enemy ship was attacking, and Mentor was floundering for things to do when Gladiator arrived to aid them. Tempest is pictured in OHotMU I#5 and has a partial entry in OHotMU Deluxe Edition#6. Thanks to Der_Gilb for the info on Silver Surfer III#79. The Imperial Guard members are generally based on DC's Legion of Super-Heroes. Flashfire/Tempest is based on Lightning Lad. His name was changed from Tempest to Flashfire to avoid confusion with DC's Tempest (formerly Aqualad). 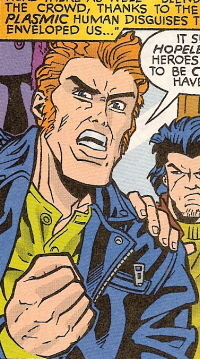 Flashfire was also one of the Imperial Guard members active in the novel X-Men: Empire's End by Diane Duane. It has to be seen if this story is canon.